False lashes are something I very rarely use, as I only feel comfortable in them if I'm going on a night out, and as I rarely go on wild nights these days I don't get to wear them too often. I was very kindly sent the KISS True Volume Lashes* a few weeks ago and they've been sitting just waiting to be used. "Revolutionary Tapered End Technology delivers real-like lashes that blend seamlessly with your own lashes. Made with 100% natural hair, these easy-to-apply lashes are so lightweight, you’ll forget you’re wearing them!" My word, I'm soooo bad at applying lashes. Seriously I need a crash course. Firstly I had to trim them down a bit to fit and then it literally took me about 20 minutes to get them to sit right, and even then they kept lifting at one side (as you can see at the photo). I dunno if that's down to the glue or my own tekkers. Honestly dunno how people wear them every day, so stressful, ha. Anyway, once I got them looking relatively ok, I was happy with them and they felt really comfortable to wear. I think I do prefer the more natural looking ones though as they are really long and fluttery. 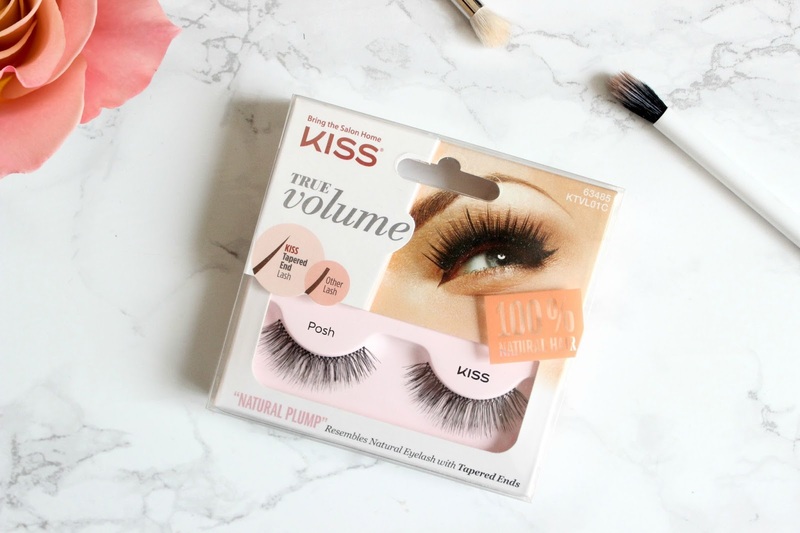 I'd like to try some other styles in the KISS range and see how they differ as £4.99 is a good price for a set of lashes. What are your favourite falsies?